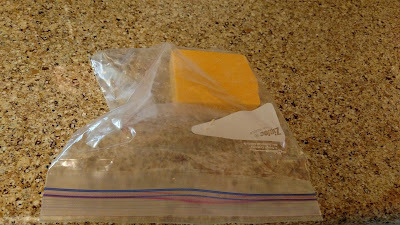 I was cutting a piece of cheese from this block of cheddar, but I was using a knife without taking the block out of the ziploc bag. "Cutting cheese with a butter knife while it's still inside the bag," Gloria said. "Hmm." "Works for me," I said. "You know that you can put the cheese on a cutting board," she said. "Sure, but then the cutting board is dirty, and that's one more thing to wash," I said. "What you don't realize is that I was seriously considering just tearing off a hunk of cheese with my hand so that the knife wouldn't be dirty, either," I said. "You really dodged a bullet there."